We love baking fresh bread, nothing beats the smell of a baking loaf! I love weekends and school holidays when we can get busy in the kitchen baking different types of bread. I would love to invest in a breadmaker like the ones reviewed on Village Bakery. For now though, we are happily baking fresh bread by hand and have a few favourite recipes! Anyone who follows my social media accounts will no doubt have spotted our favourite loafs at some point. Our absolute favourite bread to make (and eat!) is the italian chocolate chip bread. It goes lovely with some chocolate spread. Our second favourite is a crusty white loaf, fresh bread is simply gorgeous! You can’t beat an original recipe. We regularly use the same recipe to make this as it comes out lovely. Beat the egg and milk lightly in a jug and add lukewarm water to make 300ml stirring well. Next, sift the flour into a bowl adding the salt, sugar and yeast. Stir until well mixed then mix in the butter using your finger tips until the mixture feels like breadcrumbs. Making a well, add the egg mixture and work into a smooth dough. Knead well on a lightly floured surface for 10minutes or until the dough is smooth. Brush a bowl with oil and place the dough in the bowl. Cover with a damp tea towel and leave to rise in a warm place for an hour or until it is double the size. I tend to use the airing cupboard for this as the boiler creates just enough heat to help the dough rise. Brush a 900g load time with oil. Gently knead the dough on a lightly floured surface for one minute or until smooth. Shape the dough the length of the time and 3 times the width. Fold the dough in 3 length ways and place in the tin ensuring the join is underneath. Cover with a tea towel again and leave to rise in a warm place for 30 minutes or until it rises above the tin. While your dough rises again, preheat the oven to 220°c. Once the dough has risen, place it in the preheated oven for 30 minutes or until firm and golden brown. Transfer to a wire rack to cool down, smother in butter and enjoy! Do you have any favourite bread recipes you always use when baking fresh bread? Choosing Daily contact lenses over monthlies isn’t something I honestly thought I would do by the end of my contact lens trial. I previously had it in my mind that due to the price difference I simply couldn’t justify it. 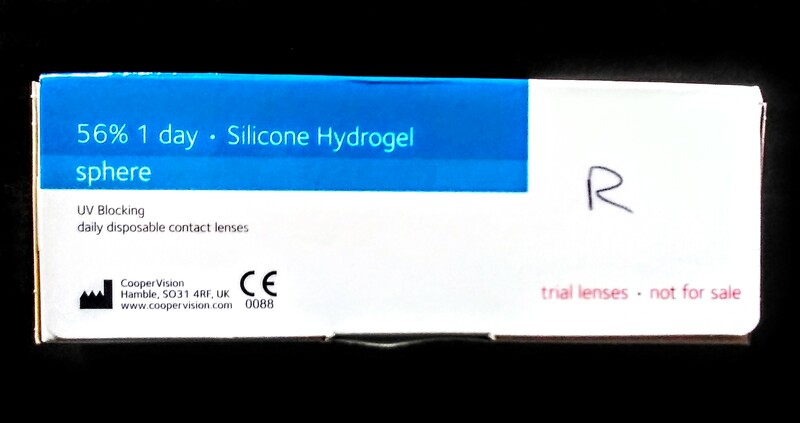 Having spent 2 weeks trialling monthly contact lenses I slowly changed my mind. Whilst monthlies weren’t uncomfortable I did occasionally notice I was wearing them, especially by the afternoon. I was mostly happy with contact lenses over my trial. Over a few days, I found them easier than I first thought to put in and out. My overly leaky eyes leaked less and less as the days went by. I could suddenly open the dishwasher or wash up without my glasses steaming up or sliding down my face. Realising just how blind I am was a bit of a shock. Suddenly I could see clearly everywhere, no blind spots under/over or around my frames. Taking Izzy to the park, I felt less anxious as I could see her at all times. I picked up a cheap pair of sunglasses just because I could and could finally see without squinting and coming home with a migraine! I’m sure I will find a much nicer pair but I could see so happily shared pictures on Instagram regardless. I noticed plenty of benefits but I did have a few small issues over the 2 weeks. The girls shouted a few days in and I pinched my eyeball! Ouch! It was fine luckily and an eye check at the end of my trial showed no sign of damage. Phew! Also quite common during the first few months of wearing contacts apparently. I also got smoke in my eye at the Birthday BBQ and managed to blink a contact out. Luckily I was overly anxious something would happen and had my solution and case on me. I managed to clean the lens and put it back in until later that evening. Living 11 floors up when it’s warm can be great thanks to the breeze with the open windows. 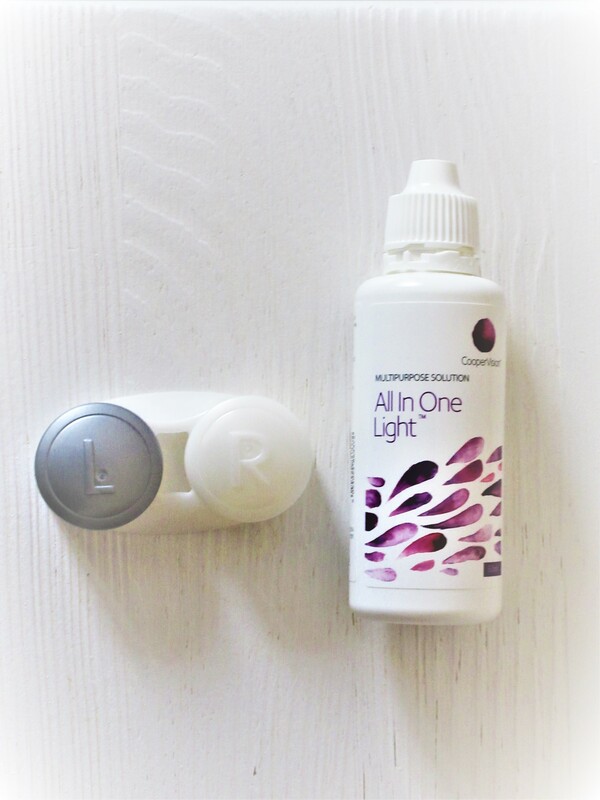 Until you need to clean your contact lenses. Then you suddenly realise how much dust and pollen is blowing in through the window! Also realising that I have a dust allergy by asking the Mr to completely hoover and dust our room. I spent two days feeling great, contacts fine, then boom! Dust everywhere, itchy skin, sneezing and contacts are near on impossible to rinse clean. Which brings me on to my next point. 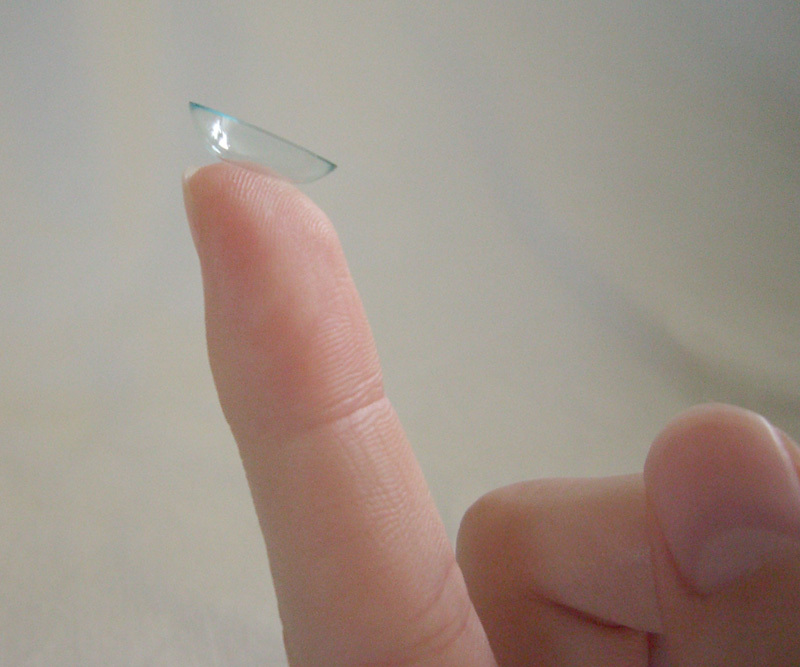 If you have long, sharp nails then cleaning contacts can be a pain. I split my right monthly contact the day before the end of my trial when cleaning it. Luckily Belson & Sons Opticians were great and had a spare which the Mr picked up for me so I could complete my trial appointment the next day. Of course, I cut my nails down to save ruining another lens. Had I been on my last pack of monthlies and I couldn’t get a spare, I would have to go without for a few days. I would also have to order 3 months worth of lenses each time making it a larger chunk to pay out at once. With daily lenses, it does cost more but as you can buy one month at a time it’s an easier cost as and when I can afford it. I see contact lenses as a luxury if I can’t afford it for a while then so be it! The fact I don’t go out much also means dailies are more practical. One month’s worth could potentially last me 3, whereas once you open a pack of monthly lenses, you have exactly four weeks to use them. I am rubbish at remembering dates. I’m regularly run out of my meds and panic at the Mr who goes and picks them up for me. Another thing I was a little worried about is forgetting when I have opened a pack of lenses. With so much dust floating around, the girls being curious and my occasionally ridiculously sharp, long (natural!) nails, being able to put fresh lenses in each day will have me worrying a lot less about damaging my eye in any way. When it came to the end of trial appointment I had made up my mind. If the optician was happy my eyes were suitable for lenses then I would continue but swap to dailies. I had to wear my monthly lenses for at least an hour before my appointment. This gives the lenses a chance to settle on your eye and gives the optician a chance to check your vision and how the lenses sit. Afterwards, I was asked to remove the contact lenses so my eyes could be checked again to make sure the lenses weren’t causing any issues. With the all clear, we discussed how I had got on with the contacts for 2 weeks. As Well as the points above, I also mentioned that I felt my left eye needed a slightly higher dioptre at the beginning of the tests and we agreed I did need the next lens up. The staff at Belson & Sons are lovely, they really listen to you which I really appreciate having had bad experiences elsewhere. Any question I ask is answered, everyone is happy to help and the whole team always have smiles on their faces! I was pleased to hear my eyes were healthy and I could continue wearing contacts. Having discussed my worries with monthlies we agreed daily lenses sounded like a good option. I was given a trial box of dailies to get me through and asked to put a set in to check they were comfortable. Daily lenses have a slightly different fit and are slightly thinner too as they are single use. It took me a little longer to put the thinner daily lenses in but they went in ok. After another quick check that they were ok and felt fine, I was pleased to notice a difference. Because the lenses are thinner I felt nothing after about a minute. They fit comfortably and I knew instantly I had made the right decision. I had a few days of contacts as well as my monthlies to help me decide what I preferred. Having noticed such a difference though, I decided to order a month of dailies there and then. Having spent a few days wearing daily contact lenses I am so relieved I ordered more. I haven’t noticed that I’m wearing them. Even when I think about the fact I am wearing my contact lenses I can’t feel them! Going to the Dickens Festival on Saturday was lovely, I could see everything perfectly, I could wear my sunglasses whenever I wanted without having to keep swapping back to my normal glasses constantly. Daily contact lenses are definitely the way forward for me. I would definitely recommend talking to your optician if you’ve ever thought about contact lenses. I think trying them is a game changer, they might not suit everyone but it’s worth a try, at least it was for me. Have you tried Contacts before? Do you prefer Daily Contact Lenses or Monthly Contact Lenses? 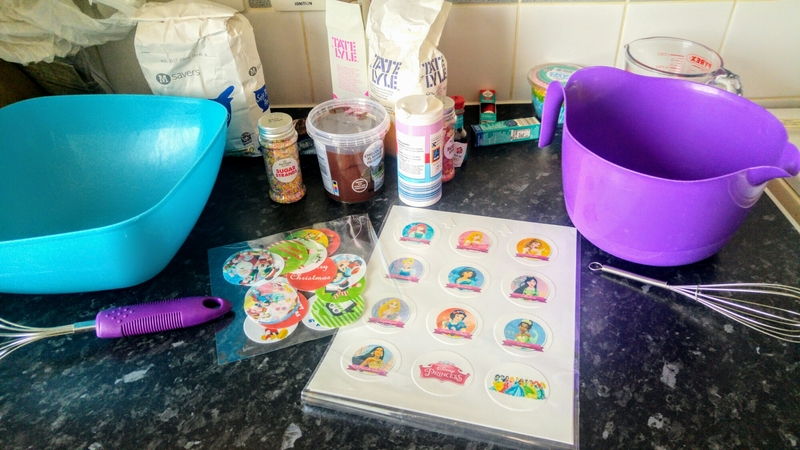 The girls had some baking fun yesterday making cakes after I was given a £15 off code to try out some of the Toppers from MyCupcakeToppers in exchange for a review of them. After looking through MyCupcakeToppers site I picked out some lovely Minnie Mouse & Disney Prince Real Icing toppers (12 for £6) that I knew the girls would love. For our Minnie Mouse & Disney Princess cakes the girls made a mix for 12 chocolate chip cakes each. They quickly got their mixes made up, poured into the cases and into the oven.. so they could lick the bowls of course! We loved the cakes and all helped ourselves to a few since we made 24 in total. The real icing cupcake toppers were amazingly yummy, even the Mr who isn’t keen on cake toppers really enjoyed it and munched through quite a few cakes! The real icing toppers are absolutely brilliant and the printing is amazingly clear, they make the girls messy (but tasty) cakes look lovely. I will definitely be ordering again in future for special occasions. I love how many design choices were available on the site. If you can’t find a design you like you can upload your own images or fill out a form with details of what you would like and the in-house design team can see what they can do for you too! Want to make some too? Check out our recipe below. 1. Preheat oven 180°c. Cream butter and sugar and add vanilla extract. Beat in 2 eggs. 2. Fold in the flour & throw in the chocolate chips. 3. Fill 12 cases halfway and bake for 10ish minutes until brown. 4. Let cakes cool (and sit on your hands to stop yourself eating them warm) before adding the frosting. 5. Pop the Real Icing sheets in the oven (once it’s cooled/cooling so it’s just warm) until the icing is easily removed from the sheets. 6. Add toppers to your cakes and ENJOY! What do you think of our recipe will you be trying it out or do you have one of your own we could try? How lovely are the cupcake toppers? What design would you go for?